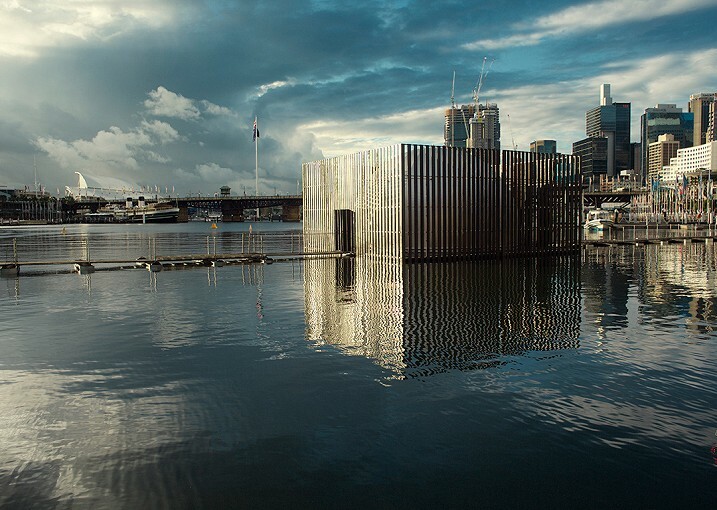 Created by five international artists (Robyn Backen, Andre Dekker, Graham Eatough, Nigel Helyer and Jennifer Turpin) and jointly developed by Sydney Harbour Foreshore Authority, Glasgow Life / Merchant City Festival and Urbane Künste Ruhr / Ruhrtriennale, Nomanslanding made its debut at Darling Harbour in April 2015, and opened at the Ruhrtrienniale in Germany in September 2015. In 2016 Nomanslanding will travel to the Merchant City Festival in Glasgow. A pair of identical floating walkways are sited on opposing shores of waterways in Australia, Scotland and Germany. 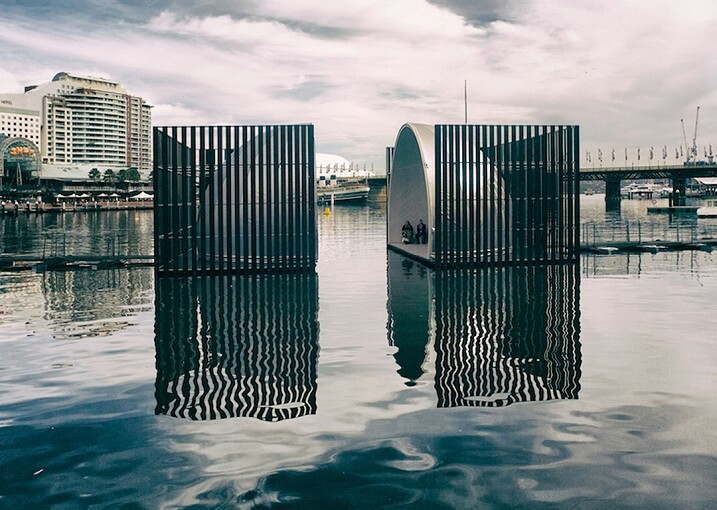 Initially installed in Sydney’s Darling Harbour, the floating walkways will travel to the Duisburg Ruhrort Ruhr district and the Clyde River in Glasgow. The walkways extend slowly out to ‘meet’ halfway and then contract back to shore. Nomanslanding features a pair of floating, extendable walkways, reminiscent of early 20th century naval pontoon bridges. Visitors approach from opposing shores across the water, in an unfamiliar no man’s land, to arrive in a dome structure in the middle of the bay. 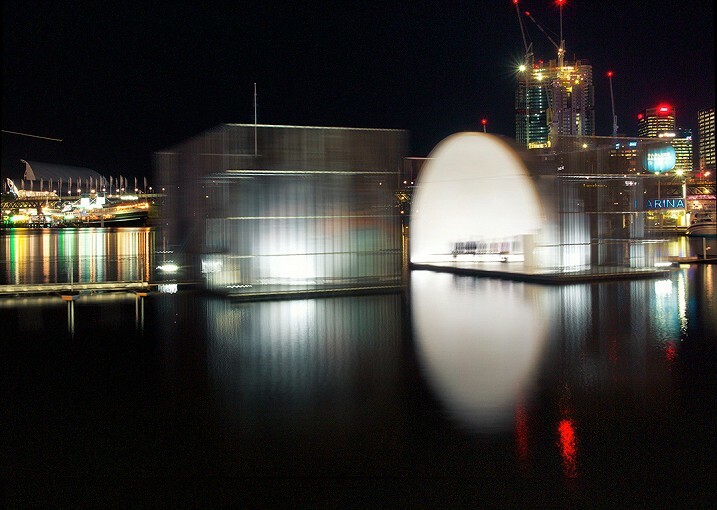 The dome structure is split in two and so visitors peer across a 10-m divide of water at each other – all the while with the cityscape of Sydney rising above them beyond the bay. The two halves of the dome structure then move together, the gap between them diminishing, and visitors from opposing sides are united in a chapel-like, shared space for contemplation. 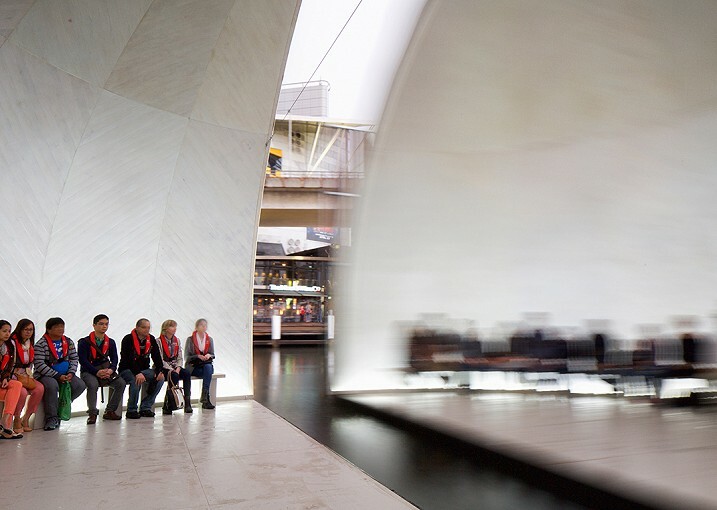 The experience is intensified by the acoustic qualities of the space. Like a ‘whispering gallery’, the sound of a voice is amplified in eerie reverberation. Within the dark dome the audience experience a multimedia installation/performance; dramatic soundscape, a vibrating cupola and poetry ricochet across the dome, leading the audience from terror to redemption.